Vanessa German has created a series of power figures that consider the secret lives of black girls in America. These radiant children, richly adorned with accumulations of found objects and glittering embellishment, speak silently and clearly about the over-criminalization of black girls in our school systems. 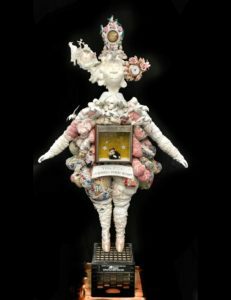 From the over-sexualization of their bodies to the lack of protection and justice for victims of sexual abuse and violence, these powerful works embody a lived experience of growing up black and female in America. German’s figures stand united and in formation to show the ways in which black girls save their power and pain to triumph in a hostile enironment. A visual and performance artist based in the Pittsburgh neighborhood of Homewood. 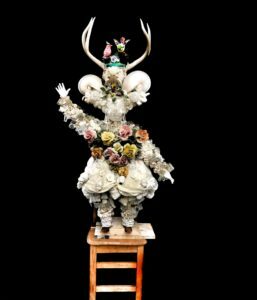 Homewood is the community that is the driving force behind German’s powerful performance work, and whose cast-off relics from the language of her copiously embellished sculptures. As a citizen artist, German explores the power of art and love as a transformative force in the dynamic cultural ecosystem of communities and neighborhoods. She is the founder of Love Front Porch and the ARThouse, a community arts initiative for the children of Homewood. Her work is in private and public collections including Everson Museum of Art, Figge Art Museum, Flint Institute of Arts, Spelman College Museum of Fine Art, Crystal Bridges Museum of American Art, David C. Driskell Center, Snite Museum of Art, Wadsworth Atheneum Museum of Art and Wellin Museum of Art at Hamilton College. 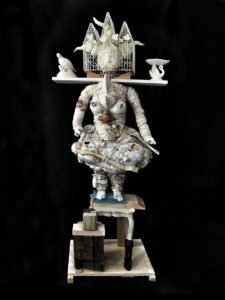 German’s fine artwork has been exhibited widely, most recently at the Mattress Factory, Everson Museum of Art, Spelman College Museum of Fine Art, Wadsworth Atheneum Museum of Art, Studio Museum, Ringling Museum of Art and Crystal Bridges Museum of American Art. Her work has been featured on CBS Sunday Morning, NPR’sAll Things Considered and in The Huffington Post, O Magazine and Essence Magazine. She is the recipient of the 2015 Louis Comfort Tiffany Foundation Grant, the 2017 Jacob Lawrence Award from the American Academy of Arts and Letters and the 2018 United States Artist Grant. Pittsburgh-based visual and performance artist Vanessa German, known for her activism as well sculptures incorporating found objects and female figurines, considers the experience of a vulnerable, underserved, and criminalized segment of America in the exhibition, Things Are Not Always What They Seem: A Phenomenology of Black Girlhood. 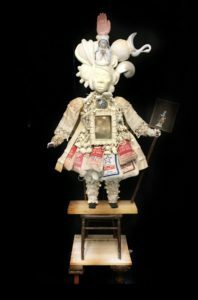 Recalling a foundation of artists who use mixed-media assemblage to relay messages about social issues affecting the black community (see Betye Saar, Renee Stout, and Kahlil Robert Irving ), German’s work combines diasporic consciousness and African religious traditions—specifically referencing minkisi, or spiritual effigies of the Kongo people. 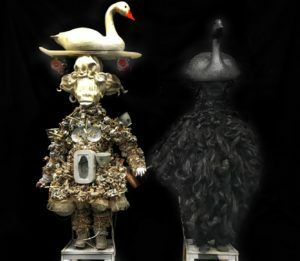 German represents the accumulative trauma enacted upon the black body in subtle ways, such as including chilled lead shot bags in She Missed—Without Knowing What She Missed and alluding to the violent murder of Nia Wilson, a Bay Area teenager, by a white supremacist in A Love Poem to Nia Wilson #2. Each work stands on its own platform in the gallery, forming a squad of silent witnesses to the precarious circumstances that reflect systemic injustices. Anita N. Bateman is the Andrew W. Mellon Curatorial Fellow in the Prints, Drawings, and Photographs department at RISD Museum and a PhD candidate in Art History at Duke University. She specializes in modern and contemporary African art and art of the African diaspora. Her interests include the history of photography, social justice art, curatorial studies/museum studies, and intersectional feminism (womanism).